In the year to the end of April 2016 new build prices in the UK rose on average by 5.7% - down on the 7.2% figure recorded to the year ending April 2015. Of particular interest, as Shaun Peart, Managing Director of Land & New Homes comments, is the fact that three separate stories appear to be emerging in relation to new build house price growth across the country. “Greater London is certainly telling one story – with prices peaking about 18 months ago, it has seen a slow decline since then with 8% price growth to April this year compared to 13.7% last year. 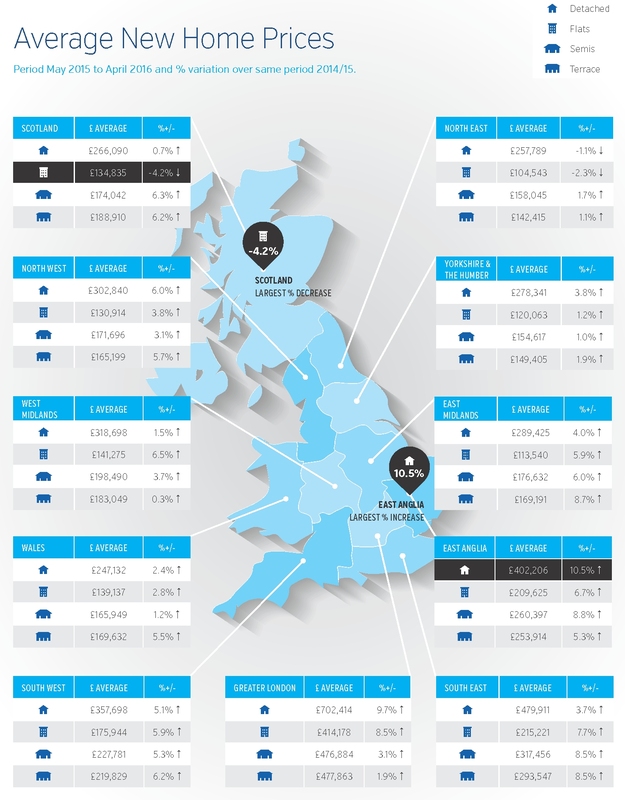 It joins areas such as Scotland, West Midlands and Yorkshire and the Humber who are all seeing a reduction in prices over the year – although to a lesser extent. In addition, and worth noting separately, is the North Eastern story where, unlike any other region, negative house price growth of -0.1% was recorded in the year to the end of April 2016 - although against a lower rate of just 2.7% last year. In contrast, the East Midlands, North West, South West and Wales have all experienced house price growth over the year with the North West leading the way with a 1.8% rise over the year.